Yike! A Brazilian Wandering Spider Appears in Tulsa by Hitchhiking. Ok, this should make us all a little nervous. This little guy (left) hitchhiked his way into the United States, probably on some bananas. He, or probably she, actually, as the female gender of spiders tend to be the larger of the two, is the deadliest spider on the planet, according to the article. 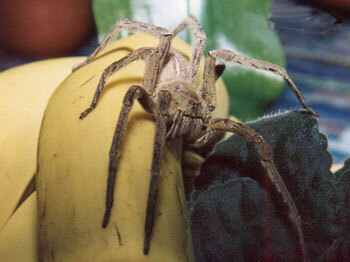 The Brazilian Wandering Spider. Wandering around looking for something to kill, most likely. 25 minutes is all you get in order to administer the anti-venom, afterwards you get a chance to meet all of your ancestors. If you check out pics on the Internet of effects of the spider’s venom. Consisting of a various toxins, proteins, and peptides the venom is enough for Guinness Book of World Records to pronounce the spider one of the world’s deadliest. Why do they end up in the U.S.? Because we like year-round produce. During the winter months when our agricultural industries are in hiatus due to cold weather, we have to go abroad for the tomatoes and lettuce we want on our Big&Tasty burger, or to add a healthy fruit to our diet. And bananas, as well as a few other fruits, are not indigenous to the United States. And if you are thinking about how dangerous it might be to shop your Walmart, consider the worker who put his life on the life to harvest your banana. Those guys get bit by all sorts of creepy-crawlies all the time. I’ve heard of spiders hitching rides on produce from overseas. Be careful when picking out your produce, and be careful when stocking produce, if you or someone you know has a job as a produce clerk in the local grocery. The clerk is more likely to get bit than a customer.